The third section of chapter four of the author's Victorian Types, Victorian Shadows; Biblical Typology in Victorian Literature, Art, and Thought, which Routledge & Kegan Paul published in 1980 and reissued in 2015. The author, who retains copyright, first created a web version in 1998, which he reformatted in in 2007 and again in 2015. 10b. 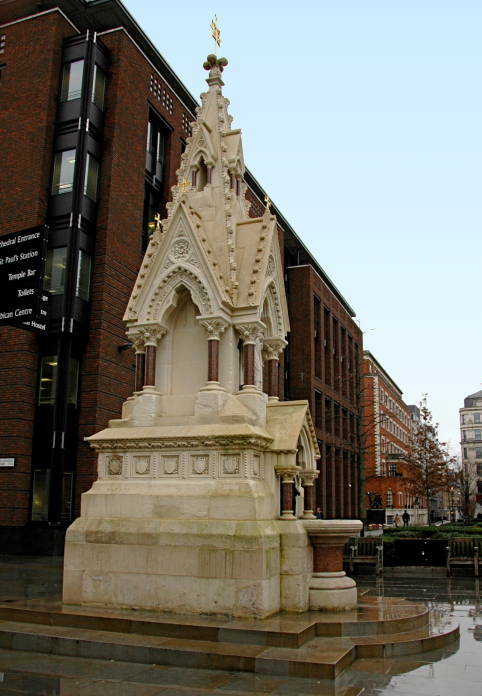 After the fountain was dismantled in about 1972 as part of the construction of new offices on the west side of Guildhall Yard, the stonework was dispersed while the bronze plaque by Durham was transferred to the temporary care of the Museum of London. The precise location of the plaque remained obscure when I wrote Victorian Types, and I was was unable to inspect it personally or have photographs of it made. I am most grateful to Andrew Saint of the Survey of London, Greater London Council Director General's Department, who provided this information, for his strenuous exertions on my behalf. In 2011 — thirty-one years after this book appeared — in print, my wife and I were walking by the left side of St. Paul's when she asked, “Did you see this?” and there it was at last! Follow for the illustration from the 1866 Art-Journal that appeared in the print version. 12. See the discussion in Chapter 5.
aving glanced briefly at the effects of typological imagery upon two major works of Victorian painting in a realistic style, we can now turn to consider the broader question of the nature of such imagery in the visual arts of the period. How do painting, sculpture, metalwork, book illustration, stained glass, mosaic, and work in other media convey the fact to the spectator that any individual image or entire scene is a type, and, once having conveyed that crucial fact, how do they guide the spectator to make a proper reading of it? A type, which is a divinely instituted adumbration or reference to some future thing, contains within itself the juxtaposition of present and future, type and antitype, literal and spiritual. The artistic effect of the typological image arises in the fact that it thus exists simultaneously in several locations, times, and senses. The artistic difficulty of the type arises in the same fact, for unless the work contains some sort of a signal, the spectator will frequently be unable to determine whether an individual image should be read as a type. He will be unable to determine, for instance, if a representation of Moses should be taken as Moses-as-type-of-Christ or just as Moses himself. One device artists use to identify the way they wish their scenes understood appears in the Dalziel brothers" wood engraving mentioned earlier. This illustration depicts Moses striking the rock; beneath the main image the artist has included as a caption the text, "Rock of Ages cleft for me," which immediately places it in a Christian context. Toplady's hymn, which combines a typological reading of the smitten rock with a second event taken similarly, establishes how the image must be understood. This humble example reminds us that the artist must place near his image either a text or some other non-linguistic device that prompts the viewer to seek the juxtapositions in the original image. In other words, juxtaposition, which is the essential or defining characteristic of the type itself, is also required to inform the spectator that he should consider any individual image a type. Oddly enough, the reviewer's remaining comments make no attempt to explain just what this "lesson" might be, and his one interpretive remark tells us only that Moses 'stands in seeming reverential awe . . . apparently wondering at the miracle God had given him the power to accomplish." This inability to comprehend even the most commonplace iconography which characterizes this influential periodical does not prevent us from perceiving that an implicit typological allusion was intended by whoever chose the subject for the fountain -- almost certainly the church authorities mentioned in the review. The depiction of Moses bringing forth water from the rock reminded those who used the fountain that they existed within the bounds of the scriptural narrative. Although there seems to be no christological type intended here — either of baptism or of the Crucifixion — the fountain clearly asserts both that God sustains man and that whatever power man has derives from God. Furthermore, since the Art-Journal reviewer so emphasizes the political fact that this fountain was intended to sustain the "masses," one is tempted to see a political type at work here. 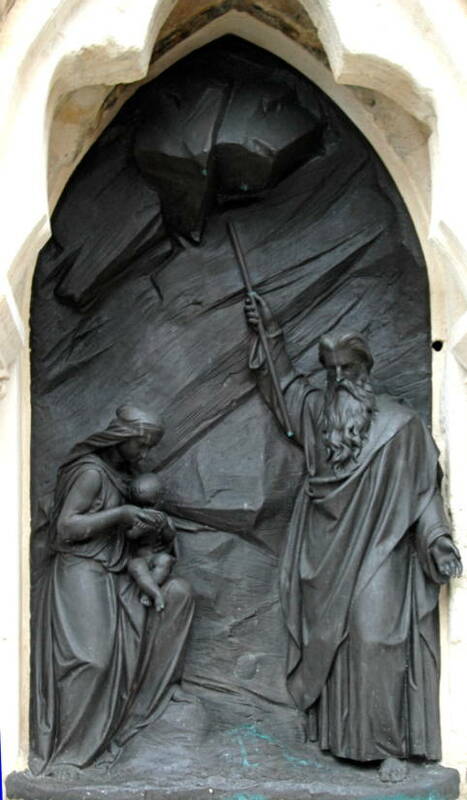 The Durham plaque, which depicts Moses bringing forth water to sustain the Israelites, establishes an obvious analogy between these earlier children of God and those who will use the fountain. But, as preachers frequently pointed out, the Israelites to whom these modern-day common people are being compared were unbelieving, ungrateful, and rebellious; and they were at last punished for their sins by snakes and other hardships during their desert wandering. Therefore, in this instance the image of the smitten rock may have taken on the following series of related political meanings: the "masses" are warned, first of all, that power comes from God; second, precisely because power thus comes from God, those who do not have it should not question those who do; third, that they should be grateful to those, such as Moses or his antitype, the parish authorities and others like them, who have sustained them; and, finally, that they should neither ask for better conditions, as did the rebellious Jews, nor display ingratitude and rebelliousness against divinely constituted authority. The idea that such a public commission might communicate this kind of pointed political message by means of types strikes us today as rather far-fetched, and yet ample evidence exists to demonstrate that political application of typological imagery did not cease with the seventeenth-century Puritans or eighteenth-century satirists. In fact, the use of typology derived from Exodus was a commonplace of nineteenth-century political discourse, and one encounters such political applications of types not only in Carlyle and Kingsley but also in working-class poets, such as Gerald Massey, and in the speeches of strikers imploring their fellows not to return to "Egyptian slavery. "12 Had the parish authorities chosen thus to make a political statement, they would not have been making an arcane theological point unintelligible to many working men and women. Rather, they would have been employing a favorite convention of contemporary political discourse, particularly among workers. Moreover, since Durham's Striking the Rock was executed during a period of renewed political agitation for the extension of the franchise, such a conservative statement in the worker's own idiom might have seemed especially timely.